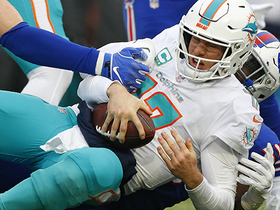 Lawson posted 2.0 sacks and a forced fumble in Sunday's win over the Dolphins. Analysis: It was the first multisack game for the 2016 first-rounder from Clemson. Lawson finishes up the best campaign of his career with 18 tackles and 4.0 sacks to go with two forced fumbles. He's still not a full-fledged starter, which could carry into next season if the Bills keep all of Lawson, Jerry Hughes and Trent Murphy. 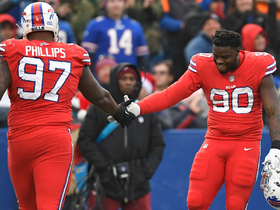 From a team perspective, however, that trio would give the Bills an excellent starting point for the defensive end spots. Lawson had two tackles and two passes defensed in Sunday's loss to the Jets. He played 28 defensive snaps. Analysis: With Trent Murphy healthy again, the two are sharing snaps at defensive end while Jerry Hughes sees the majority of playing time on the other side. Lawson has played well this season, especially during Murphy's absences, but if he's not getting a full snap share, he's not IDP worthy. That said, this has turned into the best season of the previously disappointing 2016 first-rounder's career, so he may have put himself back into the team's long-term plans for 2019 and beyond. Lawson (elbow) has avoided the inactive list Week 12 against Jacksonville. Analysis: Both Lawson and fellow edge rusher Trent Murphy are listed as active, so the Buffalo pass rush will be at full strength for the home matchup. 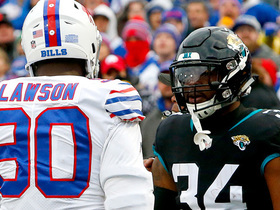 Lawson (elbow) practiced on a limited basis Friday and is listed as questionable for Sunday's game against Jacksonville, Chris Brown of the Bills' official site reports. Analysis: Coach Sean McDermott says his pass rusher will likely play, so we'll assume Lawson's on the better side of questionable. Fellow defensive end Trent Murphy is also listed as questionable, but if both suit up, they'll likely be sharing snaps throughout the afternoon. A healthy Jerry Hughes will likely get the highest volume among the team's three main defensive ends. Coach Sean McDermott said Lawson (elbow) will practice Friday and should be good to play in Sunday's game against the Jaguars, Chris Brown of the Bills' official sitereports. Analysis: We'd expect the 2016 first-rounder to still receive a questionable designation and he could even be limited Friday, but this is a much better turn after Lawson couldn't practice at all Wednesday. With Trent Murphy (knee) also trending toward playing, the Bills may get to enjoy their healthiest defensive line in quite some time, though if Murphy plays, that will likely mean less snaps for Lawson, who's excelled in the former's absence. 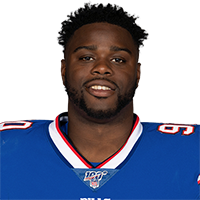 Lawson will miss Wednesday's practice after suffering an elbow injury Tuesday, Chris Brown of the Bills' official site reports. Analysis: Coach Sean McDermott is calling Lawson day-to-day. Lawson has stepped it up lately in the three games starter Trent Murphy (knee) has been forced to miss, with 13 tackles over those three games to go with a sack and a pass defensed, plus a lot of praise from the coaching staff. Murphy is back practicing on a limited basis, so the next couple days will shed more light on what the Buffalo defensive line will look like for Week 12. Lawson recorded three tackles (two solo), including a sack, and a pass defensed in Sunday's win over the Jets. Analysis: Lawson got the start Sunday while Trent Murphy (knee) was held out. The result was Lawson's second sack of the year and second pass defensed. He's been a capable defender but hasn't put up big numbers to warrant much IDP consideration. He'll look to build off of Sunday's game in Week 12, when Buffalo plays Jacksonville following its bye. Lawson's teammate Trent Murphy has been ruled out for Sunday's game against the Jets due to a knee injury. Analysis: That puts Lawson in the starter's spot again, where he'll look to build off last week's strong production where he put up seven tackles (four solo). The Jets aren't exactly an offensive juggernaut, so there should be a decent number of opportunities for Lawson to make some plays. Lawson had seven tackles (four solo) and a pass defensed in Sunday's loss to the Bears. Analysis: The 2016 first-rounder saw the field for 78 percent of the defensive snaps due to starter Trent Murphy being sidelined with a knee injury. 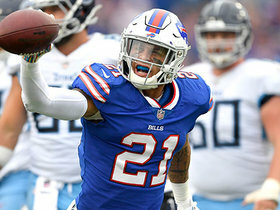 Murphy is being labeled "week-to-week," so Lawson could be in store for a starter's workload again this week against the Jets, a team that's been struggling offensively almost as much as the downtrodden Bills. 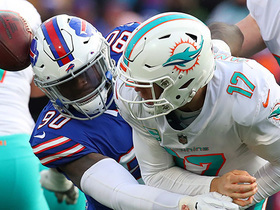 Buffalo Bills defensive end Shaq Lawson knocks the ball out of Miami Dolphins quarterback Ryan Tannehill's hands and Buffalo Bills defensive tackle Harrison Phillips recovers the fumble. 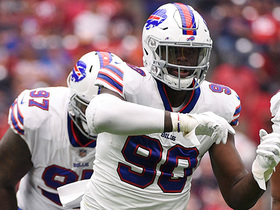 Buffalo Bills defensive end Shaq Lawson sacks Houston Texans quarterback Deshaun Watson for a 2-yard loss. 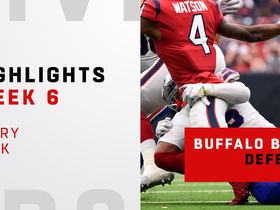 Watch to see every sack by the Bills against Houston Texans quarterback Deshaun Watson in Week 6. 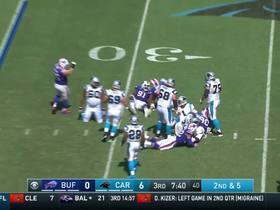 Buffalo Bills defensive end Shaq Lawson sacks Cam Newton for a loss of 7 yards. 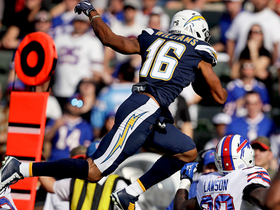 Los Angeles Chargers wide receiver Tyrell Williams hurdles over Buffalo Bills safety Micah Hyde to get the first down. 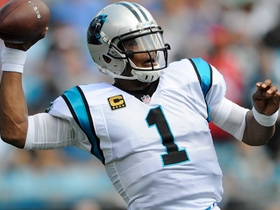 Carolina Panthers escapes through the Bills defense for a 15-yard gain.